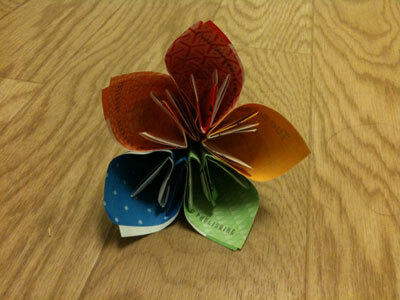 The origami kusudama flower is quickly becoming a favorite among our readers. 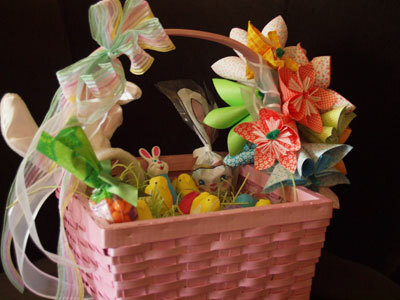 We've already received many lovely photos as you can see below. Please keep sharing and sending them in! 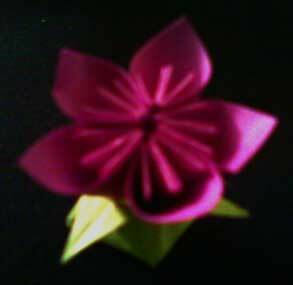 From Leandro in Minas Gerais Brazil " Kusudama Flower with Lily flower (in green). " 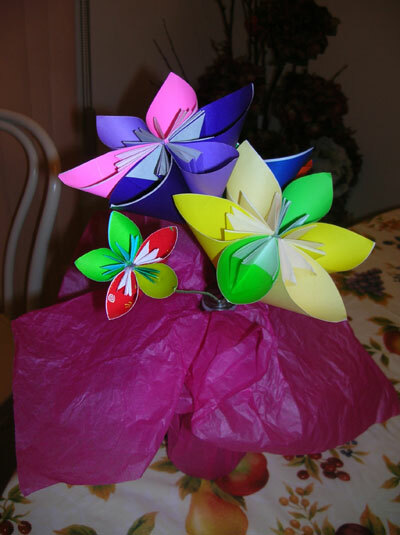 From Emily in Abilene TX " it took my a long time but i figgered it out i really love them im gonna put them in an origami vase and hang them from the ceiling "
From Jessica in Redlands " These are Kusudama flowers, which were really fun to make in so many different colors. 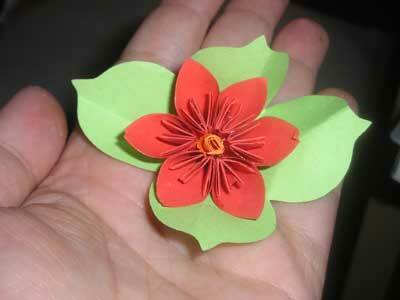 I made them out of Post-it notes. " 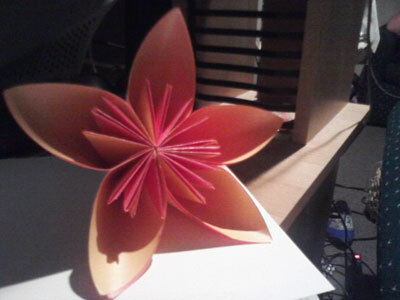 From Jessica in Redlands " Another, probably better picture of the Kusudama Flowers that I made out of Post-It notes. " 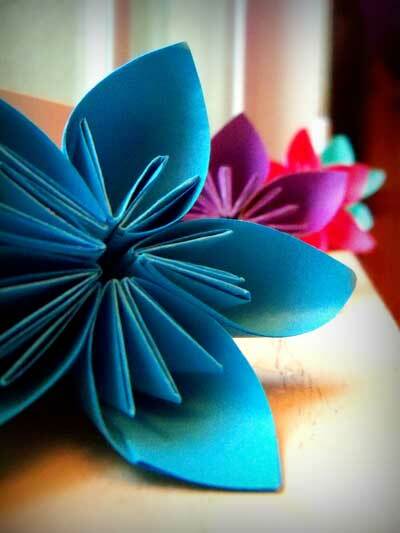 Jessica, love your colorful Kusuduma Flowers made out of post-it notes! Great photos too! 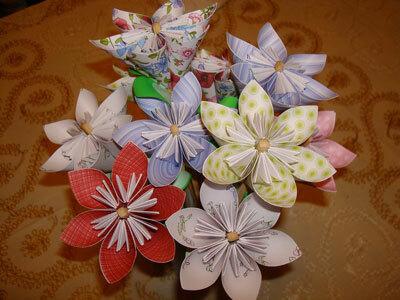 From Sherry in New Bern " Here are some of my flowers I have made. 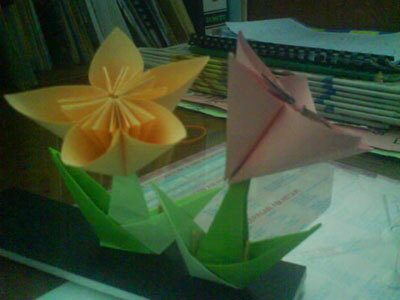 Tulips, Lillies, and Kusudamas. " 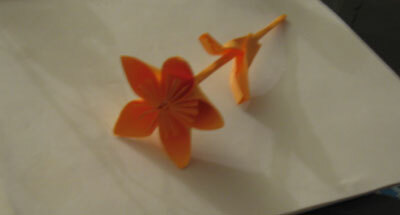 From Peter L. in San Francisco "I played around with the number of petals on each flower. 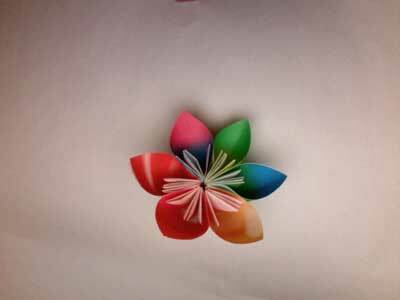 Green/Blue w/glitter (4 petals w/push-pin stem) Orange/Yellow w/glitter (6 petals w/pipe cleaner stem) Red Foil (8 petals w/pipe cleaner stem) Pink (9 petals w/pipe cleaner stem) I'm gonna get some green pipe cleaners for my next round. 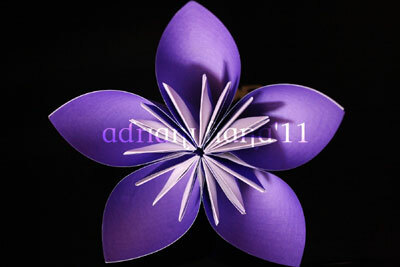 I will be sending these out for Birthday's this year. I enjoyed looking at all the various types of patterns and have found that this site has the best instructions on the web. 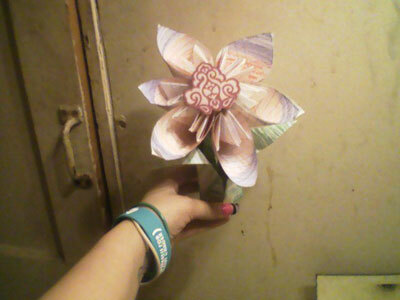 Thanks Peter"
Peter, very creative, thanks to you! 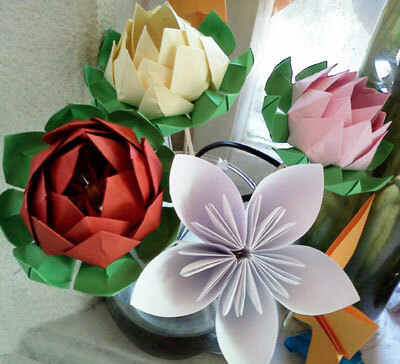 From Jamie S. in East Meadow, NY "These are my origami kusudama flowers made from the pages of an old copy of the book War and Peace. 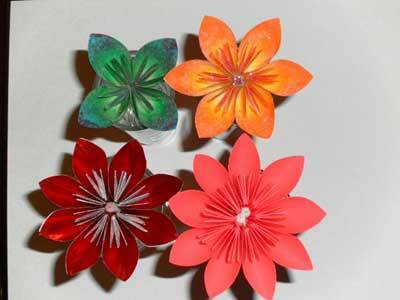 Each flower is made up of five separate "petals". 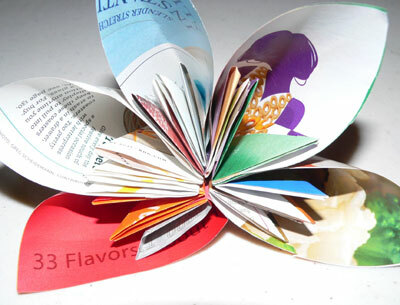 With each page of the book, you can make one petal in each of the three different sizes shown here. 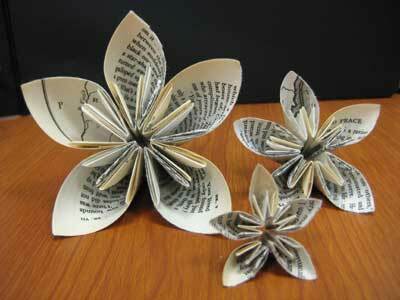 So therefore, five pages will yield you three full flowers. 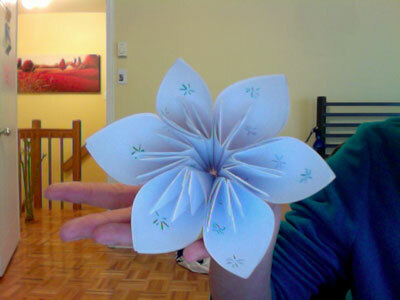 I held them together with tape which isn't the best way to do this, but I didn't have any glue handy." 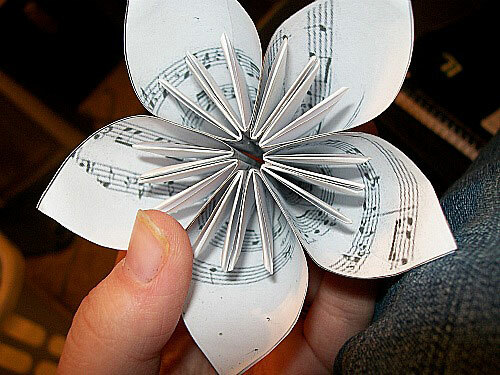 Jamie, nice recycling of the classics! 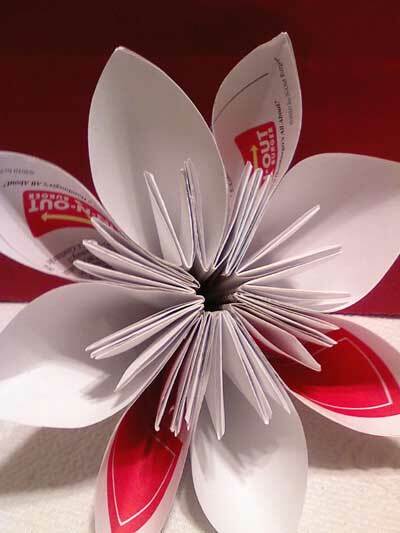 From Shelly in Fresno " used double sided sticky dots instead of glue, it turned out alright! 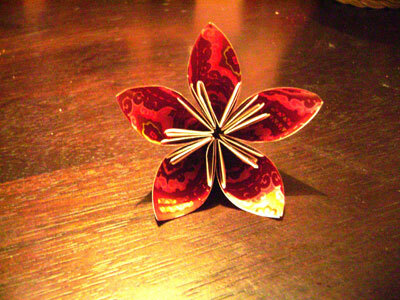 (10yen coin) "
From Brian in Lyman " Origami Kusudama flower. 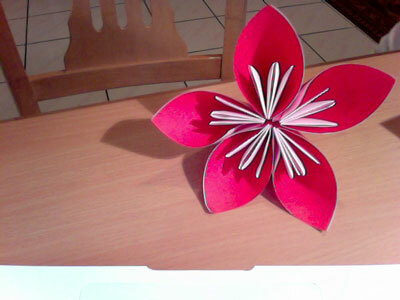 My first one and I think it came out very well! " 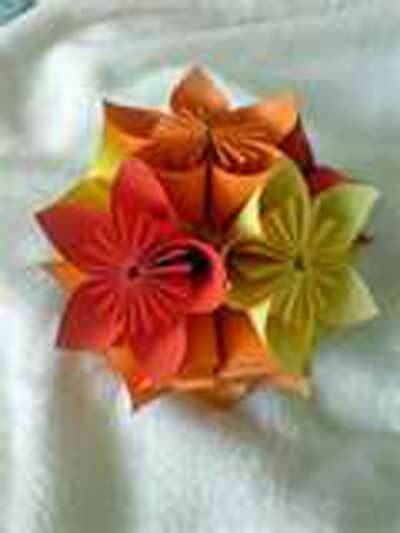 From reader in Baltimore " Kusudama in an origami star box." 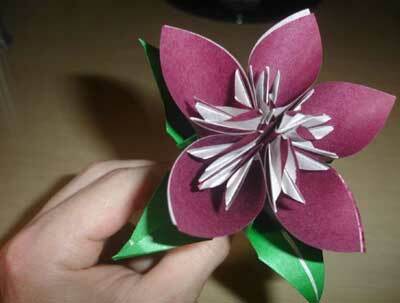 From Bri in Walnut " This is my first try at making an origami Kusudama Flower! If you made a couple pedals, you could memorize the steps (since you have to do it 5 times!) 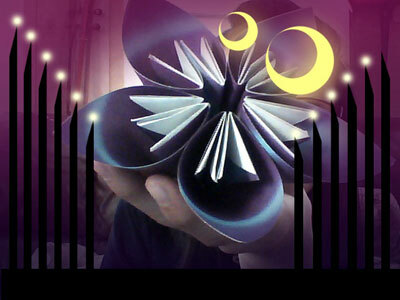 Hope u like it! " 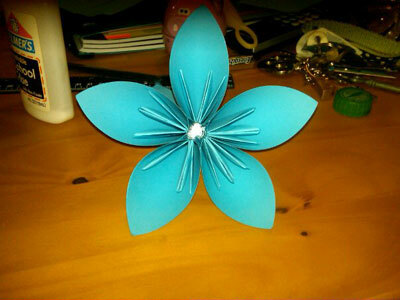 From Charlotte in Nuneaton " This was my first two attempts at a kusudama flower.First one I did with paper and the second with post-it notes. You can't quite see the second one but it's ok I didn't like it anyway! " 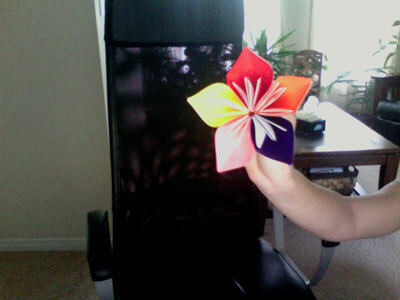 From Ana in Santa Ana " This is my Origami Kusudama Flower(: It looks soo beautiful. I love it<3 &the fact that I used an In&Out is awesome too! 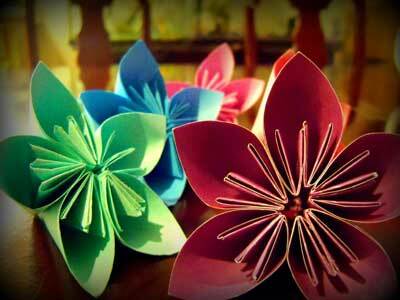 aww creativity<3! " 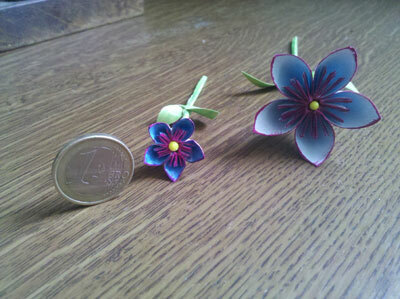 From Ilona in Utrecht, Netherlands " Made this tiny flower to decorate a table for a dinnerparty. 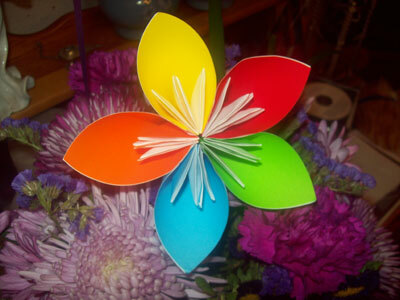 <3 "
From Sheryl in Charlotte " For my son's Bar Mitzvah, I used sheet music to create the origami Kusudama flowers to include in the table centerpieces. 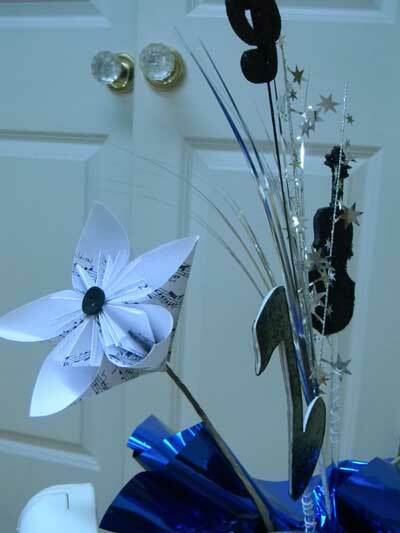 He is a violin & viola player & loved the "music" theme. " From Maryann in Providence "Purple rocks!" 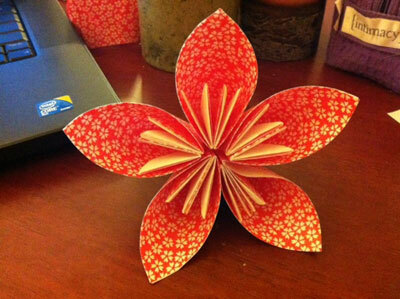 From Emily in Madison " This is my first Kusudama medicine flower. 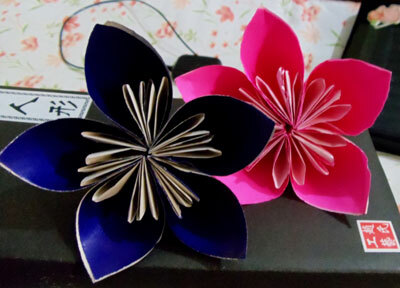 I saw them featured on Etsy recently and have been super excited to start making them! " 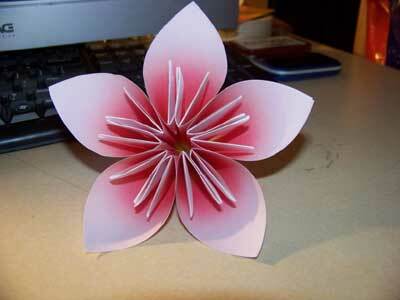 From Mugdha in Cupertino " I'm fascinated by Origami.. Every day I learn something new from your website.. It's lot of fun. Thank you. " 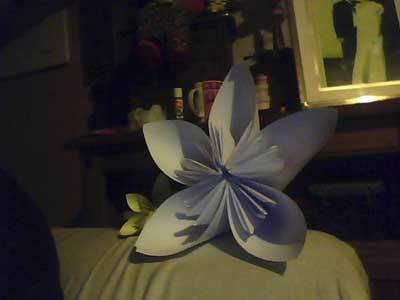 From Leona in Waterloo " kusudama flower. (: best ever. " 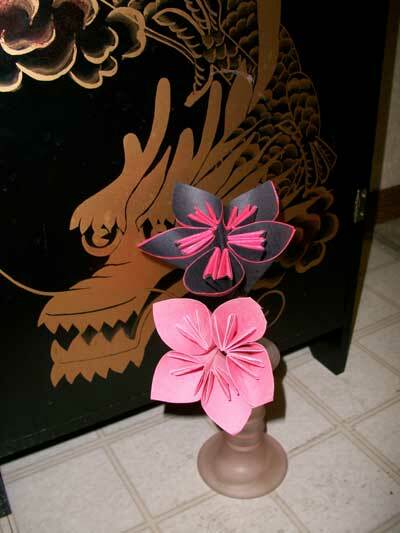 From Joey in Damascus " Didn't think my kusudama flower was that great so I added an extra petal. 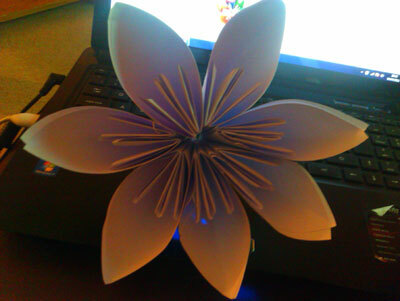 Then again it was my first try and made out of sticky notes. 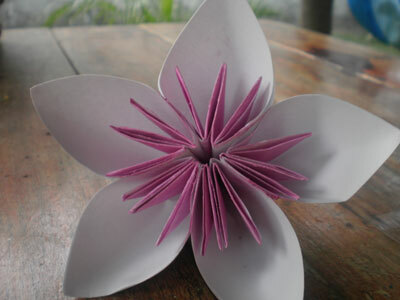 Hope you like it! " 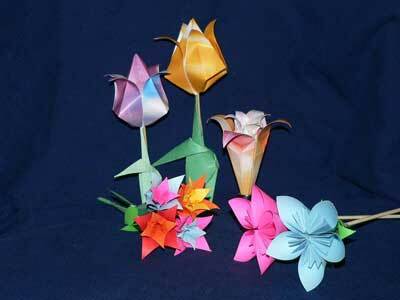 From Brian in Lyman " Here is an arrangement of small kusudama flowers I made. 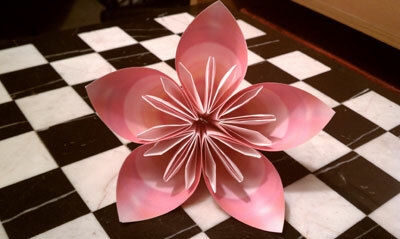 I folded them from 2x2 inch crane paper purchased on eBay. 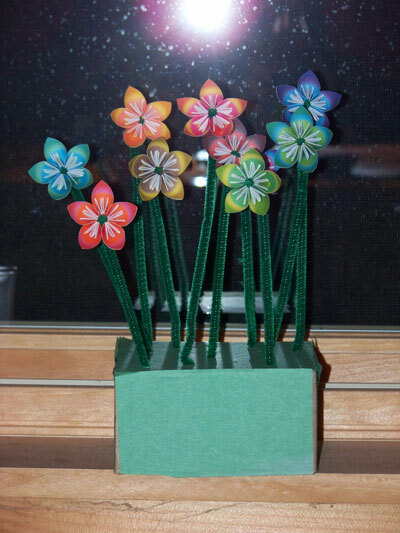 I also used green pipe cleaners for the stems. " 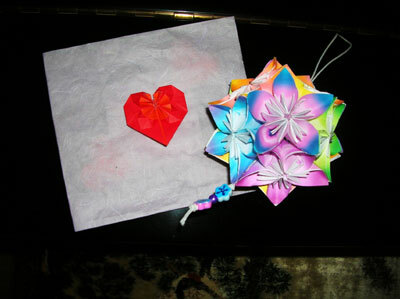 From Amanda in Vancouver " A Kusadama Flower Ball and card with origami heart made for my mom." 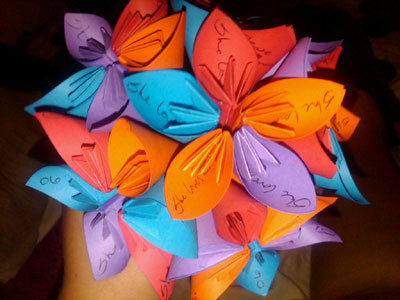 From reader in Malaysia " I happy that my student able to make this origami...Thank you because i can share this to my student... "
From Jenifer in Rosenberg " The kusudama was so much fun and easy to make.As you can tell I had to use different colored origami paper since I didn't have enough of one color.I used liquid glue and as it was drying I put a paperclip where the glue was so it would stick well. " 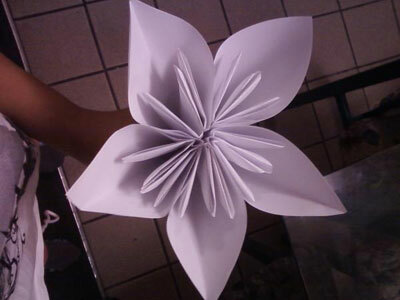 From Andrea in Honduras " This is my second kusudama flower. 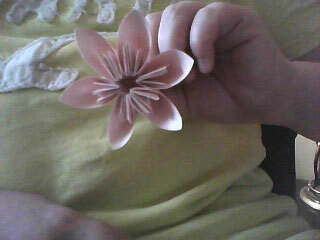 My forst one I gave to my sister. She loved it!! " 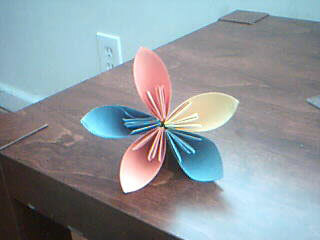 From Mary in Indiana " my kusudama flower. 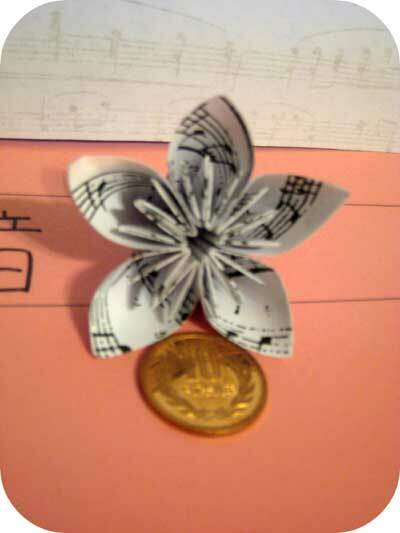 (the music notes are from the mario theme song) :D "
From Tanaya in Bloomington " this is a boquet of kudusama flowers i made for my honey. 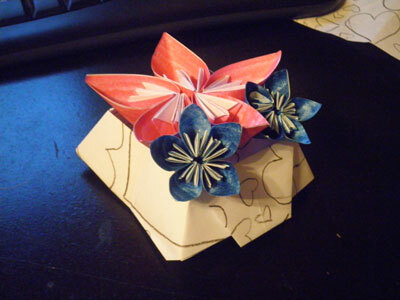 he will never be able to top these lol :) "
From Jeremy in Beavercreek " Origami Kusudama Flower "
From Devika in Gangtok " it was much easier than i thought ;) "
From Carmen in Texas " I'm a young "origamist", so mine aren't the best, but these are my origami flowers and desk organizer I made my dad for Father's Day! 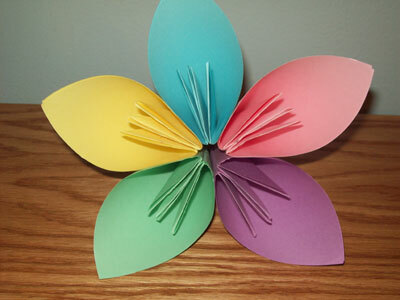 I didn't have origami paper, so I colored computer paper on one side, and, Voila! 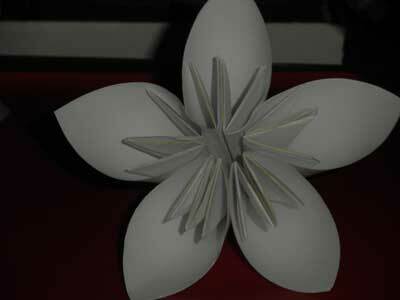 Best Website for origami EVER!!! :) "
I'm sure your dad loved it! 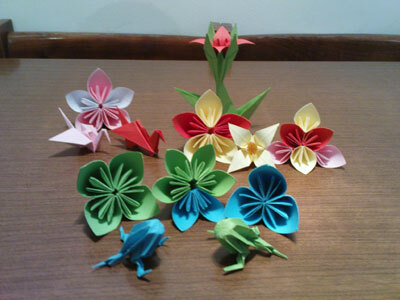 From reader in Subotica " 2 origami frogs 1 origami flapping bird (red) 1 origami crane (pink) 2 origami kusudama flowers 4 origami variations of kusudama flowers (maid it up myself) 1 origami lily 1 origami lily with stem and leaves."